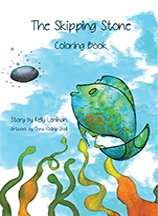 The Skipping Stone Coloring Book is based on the children’s picture book of the same name. This charming book ushers children’s imaginations out of a boring day into that realm where anything is possible. The jewel-like illustrations provide a magical backdrop to this enchanting excursion into the land of ‘what if’. I don’t believe I will pick up another smooth, flat stone on the beach, without thinking of Nick’s extraordinary day. I highly recommend this delightful book to all young children.